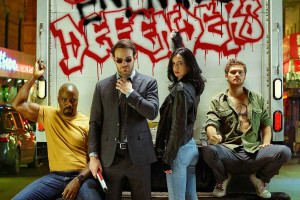 Marvel’s The Defenders will drop on Netflix on Friday, August 18. The series runs a tight eight episodes. 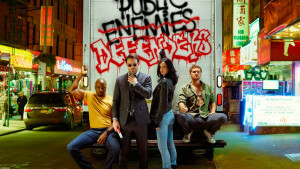 Courtesy of Marvel Comics, I viewed the first two episodes at a special screening at the ABC Building in New York City. I was invited because, with my long-time friend Arvell Jones, I created Misty Knight. Along with Arv’s wife Wanda, others in attendance were Tom Brevoort, David Bogart, Brian Overton, Larry Hama, Michael Gaydos and son Kevin, Martha Thomases, Ann (Mrs. Archie) Goodwin and her family and others I did not know. It wasn’t a large gathering, but the screening room was very nice. I had a great time. I was mightily impressed by the writing of Douglas Petrie and Marco Ramirez, as well as the directing of S.J. Clarkson. I doubt it was an easy task to bring together the leads and supporting casts of four separate series, refer to what has gone before in those four series and move the characters into a new story. Yet Clarkson and company wove together scenes of all the characters, taking care of both back story and new business and keeping the audience engaged in the overall story. Most of the scenes flowed well. I’ll discuss the ones that didn’t in a moment. The Daredevil segments pick up with Matt Murdock having abandoned his super-hero identity to do satisfying pro bono work. A scene of him laying hard truth on a young accident victim was magnificently played by Charlie Cox, as was his ongoing struggle with the lure of his other identity. Also pleasing were his scenes with Deborah Ann Woll [Karen Page] and Elden Henson [Foggy Nelson]. 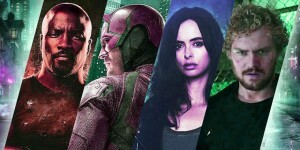 I’m hoping the three continue to move toward their former camaraderie in the next season of Daredevil. Jessica Jones [Krysten Ritter] is struggling with her new fame in the wake of her lethal defeat of Killgrave in her own series. Her adoptive sister [Trish Walker, played by Rachael Taylor] is worried for her and with good cause. Her friend Malcolm [Eka Darville] has insinuated himself into her stalled private eye business. All these interactions are wonderful. Luke Cage [Mike Colter] is out of prison and finally has that cup of coffee with Claire Temple [Rosario Dawson], so brilliant as our doorway into all four of the series. Misty Knight [Simone Messick] is now part of a city-wide task force and steers Luke towards some ways he can help the Harlem community. Iron Fist [Finn Jones] and Colleen Wing [Jessica Henwick] are still tracking down the Hand without much success. They get their asses handed to them by [redacted], but do find a lead that brings them back to New York. Sadly, the Iron Fist segments are the only weak link in these two episodes. Jones is not on the same level as the other leads and his mediocre performance doesn’t give Henwick much to work with. Sigourney Weaver plays Alexandra, a character who is first shown as vulnerable and then elegant and then so scary she intimates one of the scarier supporting characters. If I had to name the top three performances in these episodes, I would rank her with the always-incredible Colter and Messick. The individual quests of the characters start to overlap in these first two episodes, though the entire quartet has not yet “formed” their team. 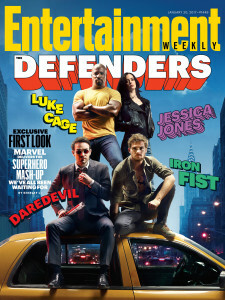 Matt Murdock meets Jessica Jones in the second episode, “rescuing” her from a Misty Knight interrogation. It turns out that Luke Cage was represented by Foggy Nelson, who works for attorney Jeri Hogarth [Carrie-Anne Moss] who has represented both Jones and Danny “Iron Fist” Rand. Foggy’s outsourced some cases to his friend Matt and one of those includes representing Jessica. Luke tries to help a young man who has already lost a sister and a brother to the streets and that ties in with whatever Alexandra is planning. Which is the case with the missing person job pursued by Jessica. Luke’s “case” leads to his meeting Danny and an entertaining fight between them. None of this feels forced. Though we don’t know exactly what Alexandra’s planning, it’s clearly something major enough to affect the entire city. I can’t wait to see how it all plays out. Here comes the blasphemy part of my review. Although Luke Cage and Danny Rand are besties in the comics and generally work very well together in the comics, I don’t want to see a similar bromance in the Marvel Cinematic Universe unless actor Finn Jones ups his game considerably in the remaining six episodes. My bottom line on the Defenders is that it’s well worth watching. Only doing eight episodes keeps the tension of the overall story at a high level. The first season of Luke Cage is still my favorite of these Netflix series, but I have an open mind as to where Defenders will fall on my list. It could be a contender. Here’s a non-Defenders reflection based on the conversation I had with Marvel executive editor Tom Brevoort at the screening. Because I sort of relish my somewhat outsider status in the comics field, I don’t keep up with editorial comings and goings to the extent I should. On the other hand, to my credit, I also ignore the gossipy “Let’s you and he fight” click bait promoted by Bleeding Cool and other similar websites. But, yes, I should know much more about the editorial workings of the leading comics publishers. Tom told me Marvel’s editorial staff numbers just a smidgin over a dozen editors and assistants. That boggled my mind given how many comic books they produced every month, how many of them are among my favorite current comics and how few of them are badly written or drawn. That doesn’t mean I like all of their comics. Readers here and elsewhere know that’s not the case. But that Marvel manages to pull this off with such a small editorial staff impresses the heck out of me. Next time you’re enjoying your favorite Marvel (or DC or other publisher) comics, give a thought to the hard-working editors who get those issues across the finish line. That’s it for this edition of Tony’s Tips! I’ll be back next week with more reviews. See you then.